The Nike Colin Kaepernick ad has massively increased the engagement with Nike. It has tremendously spiked the interest in Nike. The ad got everyone talking for one main reason. Colin Kaepernick made a very divisive statement by kneeling during the national anthem. Conservatives scream that it is disrespectful to our armed serviceman to kneel during the anthem, while liberals cite the freedom of speech aspect to kneeling. One thing is for certain, people hold strong views on the subject. Strong enough that they don’t want to stay silent about which side of the issue they are on. Views so strong that they will post them on social media and argue with friends and family about them. Selecting a polarizing issue and making a profound statement about it was a campaign tactic that Donald Trump used during his campaign for presidency. He spent far less than his opponent, Hillary Clinton, on his campaign because he made offensive statements that would divide the nation and get everyone talking. The media turned their cameras on him as he routinely put his foot in his mouth with some absurd comment. He received quite a bit of free through this method. While not all of the press was positive, the negative press just increased his brand without any expenditure on his part. The first ad aired was a digital ad which appeared on social media and select billboards on Labor Day afternoon, September 3. The second ad was a large, “Just Do It” spot with Kaepernick’s voice. It aired three days later. The advertisements were simple in nature and followed Nike’s branding and theme. The use of Colin Kaepernick, who started kneeling during the national anthem to protest racial injustice, is what got everyone talking. Nike decided to take a stand on cultural issues with this advertisement. It isn’t the first time Nike has done this. The company came out with an “Equality campaign” which showcased Serena Williams and LeBron James shortly after Donald Trump was inaugurated. Nike has often used emotional marketing in the past. Since Colin Kaepernick is an athlete and therefore eligible to be a spokesperson for their brand, they took asked Colin Kaepernick to be a spokesperson for their brand. Nike did their homework before employing such a controversial individual. They discovered that the majority of their consumers were liberal millenials who would likely be on the same page as Colin Kaepernick. Conservatives, who disagreed with Colin Kaepernick, jumped on to the concept of banning Nike. Some even took to Facebook with pictures of themselves burning their Nike gear. One would expect that a ban would be negative for a company. However, the negative press didn’t phase Nike. In fact, the negativity from the conservatives raised the awareness of the Nike brand. It fueled the discussion and kept the Nike name in the news media. 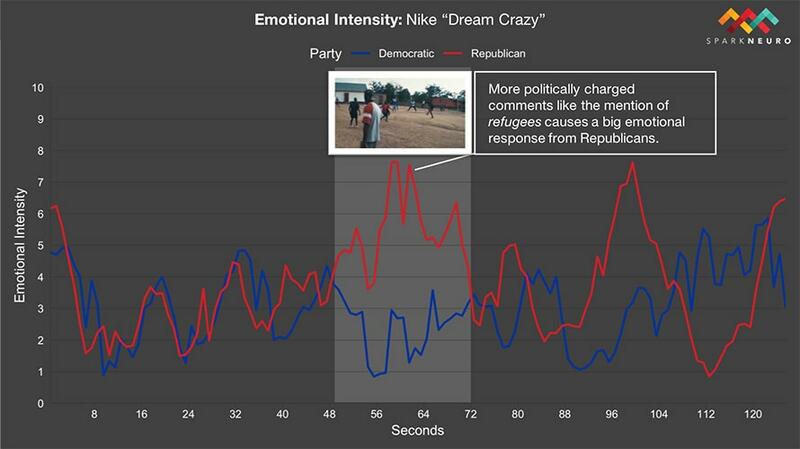 For Nike, emotional marketing works. They are one of the top athletic brands. They are a key partner with the NFL and provide them with the uniforms. In March 2018, Nike signed an eight-year deal that will ensure Nike provides the uniforms and other gear between 2020 and 2028. Nike’s use of Kapernick is somewhat risky as the NFL is currently in an arbitration fight with Kaepernick. Colin Kaepernick who alleges that he’s been unable to get back on the field since he entered free agency in March 2017 due to collusion of owners who don’t want to hire him. His claim is that the alleged collusion is a violation of collective bargaining agreement between the NFL and the players union. According to Nike CEO Mark Parker the company’s use of Colin Kaepernick in the brand’s recent “Just Do It” spots has resulted in “record engagement with the brand.” Parker stated that the company feels very proud of the work that they’ve been doing because it is resonating strongly with consumers in North America. Fans of Nike have been engaging in a social media frenzy. They feel that it is important to show their support of the issue. Many of them are getting creative with meme, while others are reading articles on Nike that they normally wouldn’t bother reading. Everyone started talking about whether they agreed with Nike’s choice in spokesperson. Even the President of the United States, Donald Trump had to throw his two cents in. This created a buzz like no other. Memes followed. The conservatives and the liberals tried their hand at creating the best memes around the political issue. Both of them either included the catch phrase that Nike used or the Nike logo, which kept their brand on the top of everyone’s lips. The conservatives took the phrase, “Believe in something. Even if it means sacrificing everything.” They applied it to their biggest celebrity, Donald Trump and placed the words in front of his picture. Conservatives who have jumped on board the Trump Train will share it with their friends and family. Conservatives altered the saying just a bit and applied it to another political issue, transgenderism. They used a photo of a transgender icon, Caitlyn Jenner, and altered the second half of the tagline to mock the transgender movement. But Nike still had their logo placed on the meme and received plenty of free publicity on another polarizing issue. Since the meme was created around another polarizing issue, it will likely be shared again and again by people who feel strongly about the transgender issue. The meme will continue to raise the Nike brand awareness as it gets shared on the various social media platforms. Liberals had their own take on using Donald Trump in the Nike memes. They are fond of encouraging impeachment of the 45th President of the United States. They simply added the Nike logo and their infamous tagline, “Just do it.” Whether or not Nike wants to jump on the Impeachment bandwagon, they got their logo in front of thousands of people after someone created this meme without spending a dime on it. Cher is a well-known liberal. Someone created a Colin Kaepernick like meme with her infamous song lyrics. They also added the Nike logo at the bottom. As it gets shared in social media, people will either be triggered emotionally to like or hate Nike. It will raise brand awareness. Some people may simply share this meme because they love Cher and her song. Since the Colin Kaepernick issue generated so much controversy, it sparked Facebook conversations for weeks afterwards. People followed along as Nike’s brand awareness increased. Interest in Nike’s financials was piqued among people who probably cared less about how much Nike was making in the past. After picking a side on a polarizing issue, people shared articles about a brand they may not have thought about since their last sneaker purchase. People are still tweeting about the Colin Kaepernick advertisement on twitter. Jennifer Lewis took to twitter to show off her latest outfit which demonstrates her support of Nike and the Colin Kaepernick ad on September 17th. She received 4.1K likes, 1.1K retweets and had 92 comments. The hashtag #Nike and #ColinKaepernick helped people find the tweet. Having big celebrities tweeting about a topic keeps the conversation going. Celebrities often have a large following that will agree with them and retweet their posts. Not only will the celebrities’ followers see the tweet, but all the friends of the people who retweeted the post. If you recall, Trump took to Twitter every time that he felt misrepresented by the mainstream media. He would post an outrageous quote that got people talking. One celebrity that showed her support for Trump, Joy Villa, wore a dress with his campaign logo on it. This is similar to Jennifer Lewis’ public support of Nike. When conservatives realized that Nike had decided to use Colin Kaepernick as a spokesman, many of them took to the internet to boycott the brand. They didn’t want to have anything to do with a company that would employ someone who knelt during the national anthem. Nationalism is one of the core conservative values. The negative emotions that conservatives had towards Colin Kaepernick spurred their decision to encourage a ban on Nike products. Sales may have plummeted among conservatives, however Nike announced on its earnings call that its revenue over the last three months, was up 9 percent to $9.9 billion. Since the Kaepernick ads ran, Nike’s stock has risen 6.25 percent, which added $6.38 billion to the company’s value. Nike’s stock fell more than 4 percent after earnings they announced the earnings. However, at least three analysts have raised the target price on Nike’s stock. Stock prices tend to fluctuate. It doesn’t appear that the choice of Colin Kaepernick has hurt Nike on the whole. 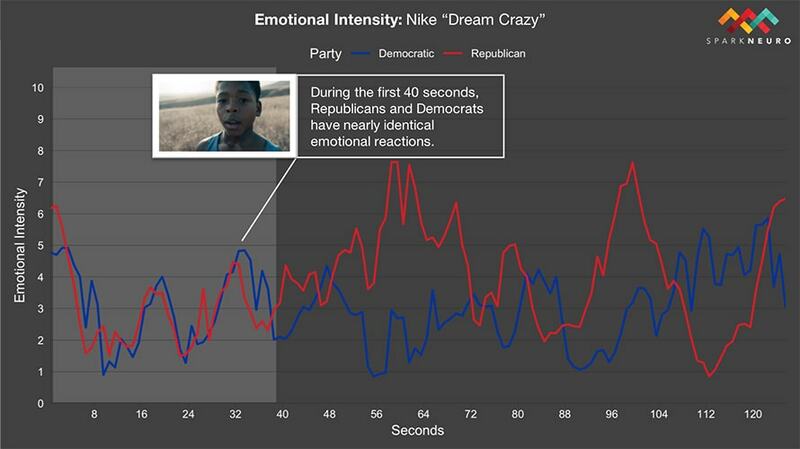 While Nike’s ad has been polarizing based on political leanings, tweets, headlines and viral videos, there is some science behind it. 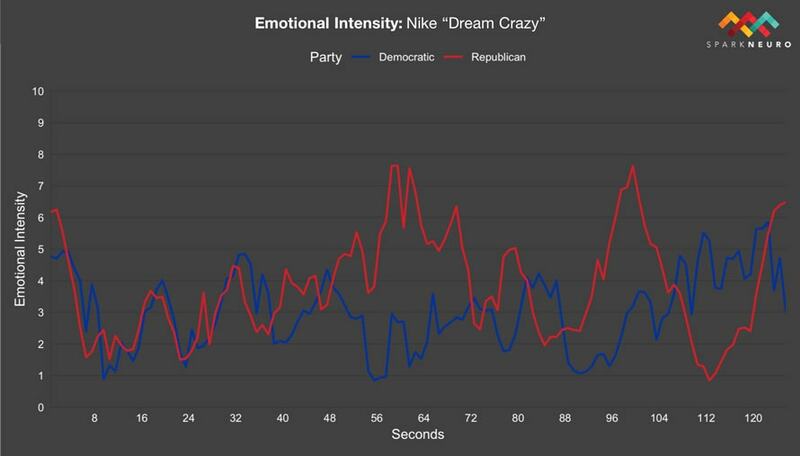 Spark Neuro, a startup that conducts neuroscience tests for brands and media studied how Democrats, Republicans and Independents viewed the Nike ad. Spark Neuro analyzed biometric data of the participants. It considered the brain waves, heart rates and sweat glands while measuring how subjects reacted while watching the ad and TV commentary. The results were surprising. Republicans and Democrats had similar emotions during the first 40 seconds. However, when they addressed controversial topics, the emotions began to show based on whether they lined up with their political beliefs. Democrats and Republicans put the content through their filter, which changes the perspective of the ad. Independents who viewed the ad didn’t view it through the same filter or have a political bent on it. The Spark study tested 60 people in New York. Participants were not told what the study was about, only that they would be viewing ads. The participants were shown a variety of related content. This ensured that everyone was equally aware of the ad and its context. This included the ad itself, clips from conservative and liberal TV channels commenting on it and footage of people burning Nike clothes. Neuroscientists can tell if a feeling is negative, but not if the participant is angry or surprised. The display of negative emotions during the ad was discouraging. Negative emotions are often more powerful than positive ones in spurring action. This may be the reason that people took so much action in expressing their dislike of the spokesperson that Nike selected and were even willing to burn socks and shoes from a brand whose politics they don’t like. Independents were actually more emotional through the ad. This suggests that they may have been struggling with how they feel about the issue. Gerrol speculates that Independents struggle because they are more cognitively engaged with the issue rather than simply trying to follow the crowd. Nike fueled the flames of the political divide. Both liberals and conservatives took to social media to share their support for or against the Nike brand. The combined positive and negative support on a polarizing issue drastically increased Nike’s brand awareness. This was the same tactic that Donald Trump implemented as he sought the presidency. He earned tons of free press by commenting on divisive issues. While this strategy worked out well for Nike and Donald Trump, it may not be right for your company. You should do quite a bit of research using it with your company and brand. Stirring up negative emotions just to get people talking about your brand will probably only work with well-established companies. It may backfire with a start-up that has yet to build customer loyalty and a strong base of support.